When I made up the 4:1 balun earlier this week, I didn’t realise that I would be putting it to use by the end of the week! Ever since I got active again, the commercial multi band dipole that I had been using for many years was no longer working optimally. When I first purchased it, it had an SWR of < 1.8:1 across most bands, but recently the SWR had had risen to around 2.5:1 across most bands. After discussing and troubleshooting the issue with the antenna manufacturer, it was decided the cost to replace faulty parts exceeded the original purchase price of the antenna. It was time to replace the antenna. I’d made the decision early that any antenna I’d put in would work from the 40m band up. the 80 and 160m bands all suffered from S9+20 noise, which tends to occur a lot in built up areas. 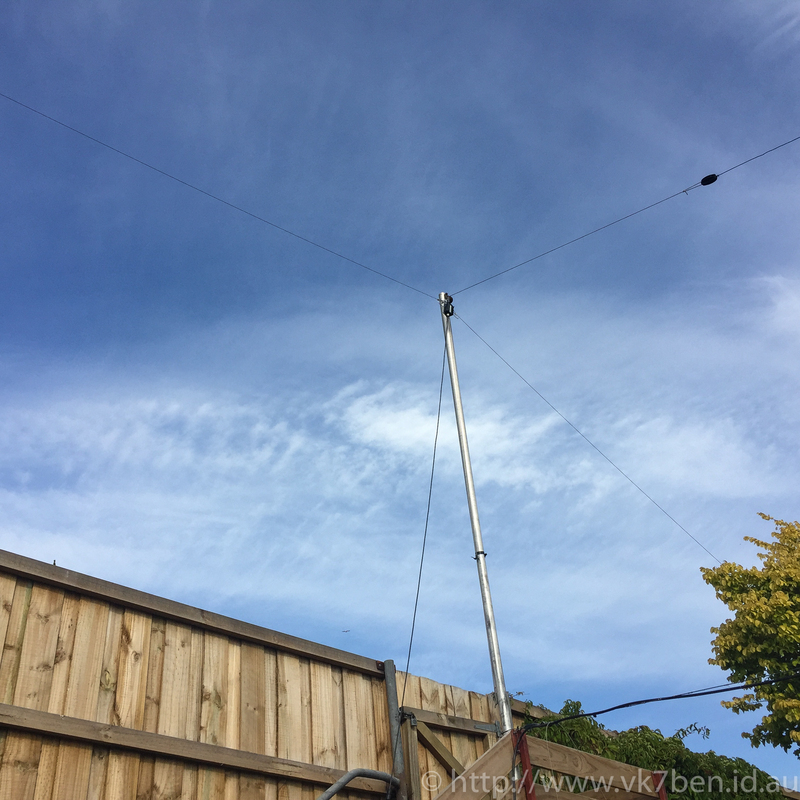 By not needing the lower bands, it also had a significant advantage of reducing the overall length of the antenna so it would fit on my block of land. With my feed point being off-centre to the block, the previous dipole struggled to fit on the land. It therefore made sense to have an OCF antenna. I settled on the “New” Carolina Windom design by K4IWL. It’s a compact antenna, (dipole was around 112′, this Windom is 66′) and promises to not need to be tuned across the primary HF frequencies from 7-30Mhz. Having a 50m fibreglass tape measure is essential when building HF antennas. I measured out 1.6mm stainless steel wire with a bit extra to trim for tuning and then using swages to make fastening loops in the end. In order to make the whole thing easier to service, carabiners have been used to secure the wire to feed point and balun, allowing for quick release and modification as required. Again, the fibreglass tape was really handy for tuning, by affixing the tape to the centre feed point, I could quickly measure the wire to confirm the correct lengths according to the design. Once everything was fastened testing proved that the antenna was going to be a winner with the SWR generally being < 1.6:1 across the bands without a tuner. A little bit of experimentation found the the SWR could be lowered further if I improved the RF choke at the bottom of coax radiator. Also, it’s worth noting that the coax radiator does not like resting against the aluminium mast – which is common sense when you remember it’s part of the antenna tuning. I’ve pulled it away from the mast for now, but will make proper stand-offs in a couple of weeks. Overall this was a great Saturday morning project building and learning more about wire antennas.